“Peter and the Starcatcher” by Rick Elice is regarded as a prequel to J.M. 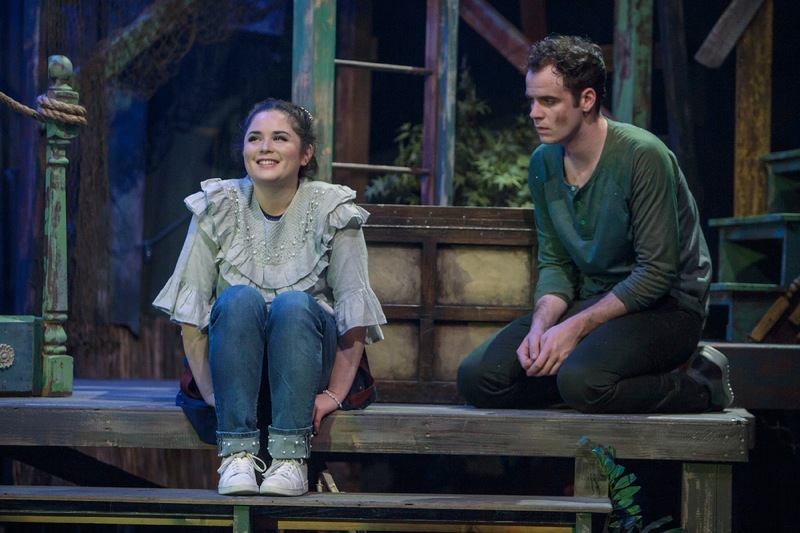 Barrie’s “Peter Pan.” This winner of five Tony Awards in 2012 is being staged by Hillbarn Theatre and directed by Jeffrey Lo. According to program notes by artistic director Dan Demers, Lo’s concept is of “a gypsy troupe mixing fun and silliness” in showing what led up to Peter Pan’s story. That concept starts before the show begins with actors’antics in the lobby and then in the theater itself, playing on the stage and running into the audience. This beginning sets the tone for what’s to come as 13 actors energetically portray an array of characters. The action is set in 1885, when two ships leave London on their way to Rundoon. Both have an identical chest. The one on the Wasp is guarded by Lord Aster (Scott Solomon). Pirates, led by Black Stache (Will Springhorn Jr.) and his sidekick, Smee (Demers), take over the Wasp. Lord Aster entrusts the other one to his 13-year-old daughter, Molly (Adrienne Kaori Walters), on the Neverland. Also on the Neverland are three mistreated orphans, including Boy (Sean Okuniewicz), who takes the name Peter after many harrowing adventures. Although the show is filled with clever staging and humorous dialogue, some of the humor is lost because several characters overact. Because some also shout, their lines are hard to understand. Director Lo should have instructed them to pull back. Also noteworthy in the cast are Okuniewicz as Boy, Walters as Molly and Solomon as Lord Aster. Musical director Amanda Ku on piano and Lane Sanders on percussion, provide accompaniment (music by Wayne Barker). The choreography is by Lee Ann Payne. The often zany costumes are by Y. Sharon Peng. The set is by Christopher Fitzer with lighting by Michael Palumbo and sound by Matt Vandercook. Despite the production’s shortcomings, notably the shouting and overacting, most in the opening night audience seemed to enjoy it. 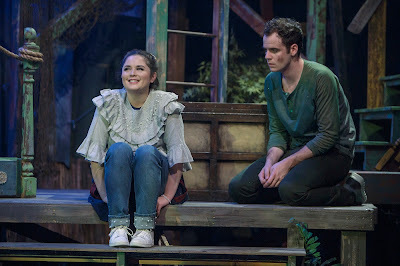 Running about two and a half hours with one intermission, “Peter and the Starcatcher” will continue through Feb. 4 at Hillbarn Theatre, 1285 E. Hillsdale Blvd., Foster City. For tickets and information, call (650) 349-6411 or visit www.hillbarntheatre.org.